The Synergy one season outer bag can be used on its own in summer conditions, for coolness and portability. The Nitestar sleeping bags are firm favourites with adventurers, festival lovers and youth expeditions. 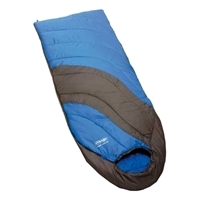 This Vango sleeping bag is a 2 season sleeping bag that maintains fantastic loft even when the weathers damp and dreary. A brushed flannel inner and double layer construction, with hollow fibre insulation to aid heat retention. The Voyager’s lightweight fabrics, insulation and compact pack size make this reassuring for adventure travellers and backpackers. create a double sleeping bag. Mummy-shaped bag with double layer of insulation this DofE and Scouts recommended bag is ideal for first time youth campers, festival goers, DofE and Scouts expeditioners. Ideal for those on adventure trips and expeditions. The Thermal Embrace System allows the sleeping bag to hug your body and maximize insulation while the aluminised reflective lining also pulls heat back. The Summit range was Vango’s premier collection of performance synthetic sleep gear. Complete with a mosquito net (hood & feet) and an anti mosquito repellent finish to prevent any unwanted insects. Perfect for those looking for a bit more leg room and width, the Nitestar Quad has both a side zip & separate bottom zip. This Ultralite sleeping bag has a great blend of technical performance and comfort for adventurers and travellers who need to travel fast and light. Mummy-shaped bag with double layer of insulation this DofE and Scouts recommended bag is ideal for first time youth campers, festival goers and expeditioners. The wicking 4T synthetic insulation - structured in a Tri-lateral construction -improves warmth, eliminates cold spots and conforms closer to the body. Thermal-Reverb redirects heat radiated from the body back to the user making the bag warmer. Delivers an optimisation of warmth, weight and pack size, with high quality hydro-barrier duck down fill. Planet 140 Down will keep you warm on your travels while being incredibly lightweight with a tiny pack size. While the treated mosquito net at the head and foot, keeps out unwanted bugs. Blend of hydrophobic down and 4T synthetic insulation, giving the user all of the insulative properties of a down bag, resistant to wet conditions. Featuring 1000 grams of 650 Fill Power 90/10 Duck Down, trapezoidal shaped baffles, Thermal Embrace elasticised lining, shell/lining 30D Nylon, with a water repellent finish to the shell. Hydro Barrier Down in a reflective V-baffle construction, all wrapped in lightweight 20D nylon. Ethically sourced down, for an extremely low comfort temperature rating coupled with low weight. For pushing the limits of minimum gear, maximum adventure.